There was a bit of snow overnight. Just a couple of centimetres, but enough to make the world look white. As usual, the gritters have been out in force and cycling continues at the usual rate. On average, all year around, each person in Assen each makes just short of 1.2 bicycle journeys per day. The high levels of actual and subjective safety are the reason why. Cycle paths are always kept in safe conditions to preserve the high cycling rate. This top photo is of the road at the end of ours. While the road itself is just a 30 km/h (18 mph) speed limit residential road which goes nowhere, a main cycle route emerges at this point and continues behind me. As you can see, the cycling route has been cleared of snow but the minor roads have not unless they are part of a cycling route. Further along, we find the cycle paths are all miraculously free of snow, even if the canal is not. Later on there were people clearing ovals on the canal for ice-skating. The ice is very thick now, so safe to skate on. Many people are hoping that this winter will be cold enough for the Elfstedentocht. This is a one day 200 km ice-skating race & tour between 11 cities in Friesland (a province of the Netherlands). Around 15000 people take part. This bicycle road is also an important route, being used by thousands of bikes per day because it provides a direct route to an outlying suburb. It may look a bit like there are bike lanes here, but actually the red parts together are substantially wider than the black bit in the middle. Also, the road is only about 200 m long and provides access only for drivers. Cyclists can go through bollards at either end and continue their journey on cycle paths. On small patches here that the gritters had missed there were many many bicycle tracks. I got here a little late to see the rush hour in full swing. Much closer to home, our children set off in the snow to their schools this morning. 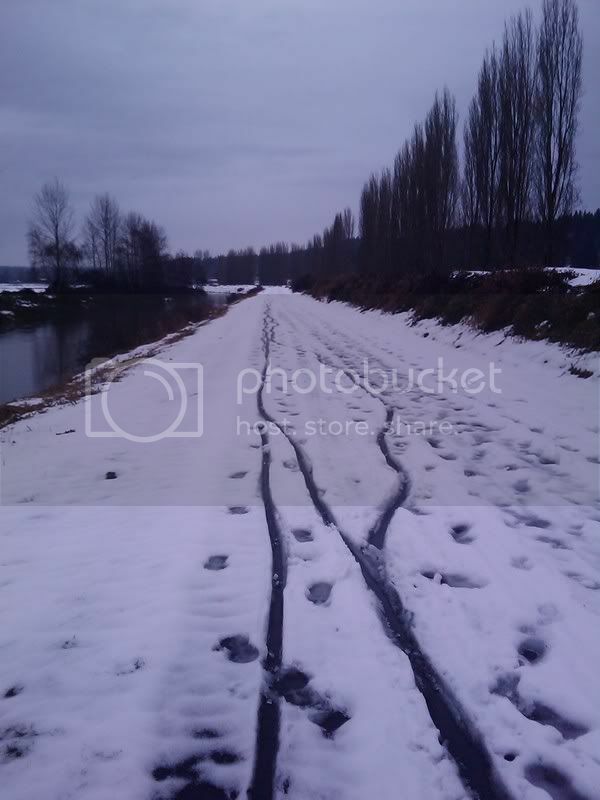 These are the tracks they left as they went, footsteps alongside the wheels turning into just the wheel tracks as they got onto their bikes. It's quite normal for children here to cycle to school every morning, whatever the weather. In this photo you can also see some play equipment on the small green in front of our home. There is always play equipment near homes. This photo is taken a little further along our small street. I count nine bikes (from eight houses) having already made a right turn at this point. Quite a few more went straight across, and of course I was about to add my own tracks. Lastly, here is a photo from our local paper today of the gritting trucks and their drivers in Assen. In the photo you can see five full sized trucks and six of the smaller ones which can access the cycle paths. There is a map of cycle path gritting routes on the council's website. There is also freely available salt for using on your own driveway or around your house. We have some. It's a mixture of fine salt and gravel slightly larger than sand. There are now quite a few posts showing the result of the extensive gritting here. They each have the gritting tag. There are also a number of other winter posts. Some of these show how extensive the gritting is. It's not just something that happens within city boundaries. I should also point out that the next time I went past the point in the top photo, the road was clear of ice too. However, the cycle path and route was done first. My jealousy knows no bounds. The URL linked in my name has a link for a photo I took recently when riding back from Redmond to Seattle, Washington. It was one of the better and more beautiful sections of the bicycle trail. Of the 50 km trip home, only about 1 km was ploughed, with snow and packed ice up to a depth of 15cm deep. Here where I am in Canada all the snow is pushed onto the few bike lanes we have. Still get out and ride though. Only difference is your riding out with vehicles.